In the age of the Fourth Industrial Revolution, frontier technologies are transforming not only our daily lives but also the planet`s development tragectory. The revolution is driven by innovations in artificial intelligence, automation, blockchain and other cutting edge technologies. This calls for greater urgency in bridging the staggering digital divide in the Asia Pacific region that is exacerbated when countries at the forefront of the Fourth Industrial Revolution quickly leave behind those that are slow at technology uptake. The Sustainable Development Goals mandate that we must do our best to reduce increasing inequalities and ensure that “no one is left behind” in these times of opportunity and challenge. Furthermore, enhancing broadband connectivity at the national, regional and global levels contributes to the social, economic and environmental aspects of the Sustainable Development Goals, in particular, target 9.1 (Develop quality reliable, sustainable and resilient infrastructure, including regional and transborder infrastructure, to support economic development and human well-being, with a focus on affordable and equitable access for all) and 9.c (Significantly increase access to ICT and strive to provide universal and affordable access to the Internet in least developed countries by 2020). Importantly, under Sustainable Development Goal 4 on education, one target requires member States to expand educational opportunities in ICT. In gender equality, Sustainable Development Goal 5 includes one target of “Enhancing the use of enabling technology, in particular information and communications technology, to promote the empowerment of women”. Another target under Sustainable Development Goal 17 further specifies the role of ICT as a means of implementation. In response, United Nations Economic and Social Commission for Asia and the Pacific (ESCAP) convenes the Asia- Pacific Forum on Sustainable Development (APFSD) on a yearly basis, as a unique regional platform for dialogue between ESCAP member states and other stakeholders on the implementation, follow-up and review of the 2030 Agenda for Sustainable Development Goals. Earlier this year, the meeting of the Regional Inter-Agency Working Group (IAWG) for Information and Communication Technology (ICT) was organized in Bangkok to explore ways to collaborate and create synergies among UN agencies implementing ICT for development initiatives in Asia and the Pacific. 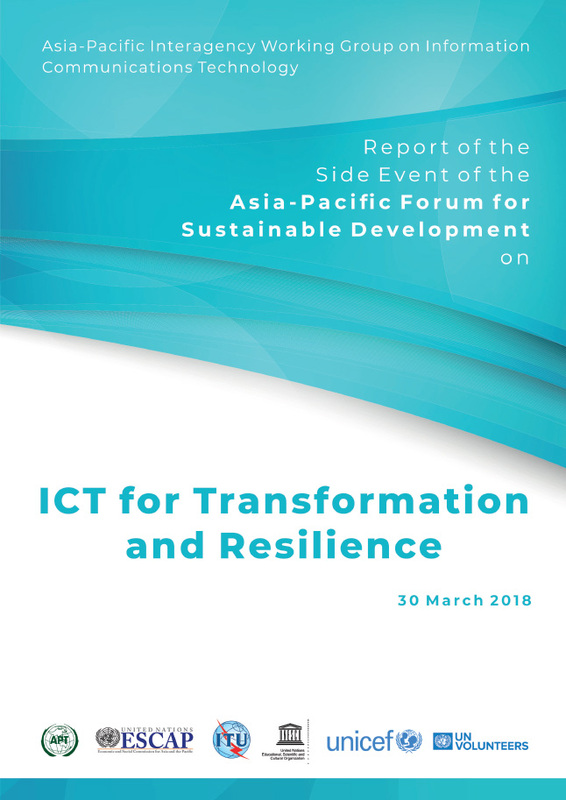 The participating agencies decided to join forces and advocate for the transformative capabilities of ICT at an inter-agency side event and joint exhibition during the Fifth Asia-Pacific Forum on Sustainable Development (APFSD) on 30 March 2018. Those collaborative efforts demonstrated how the expertise of respective agencies contribute to the achievement of SDGs through the systematic and strategic use of ICT and digital technologies.